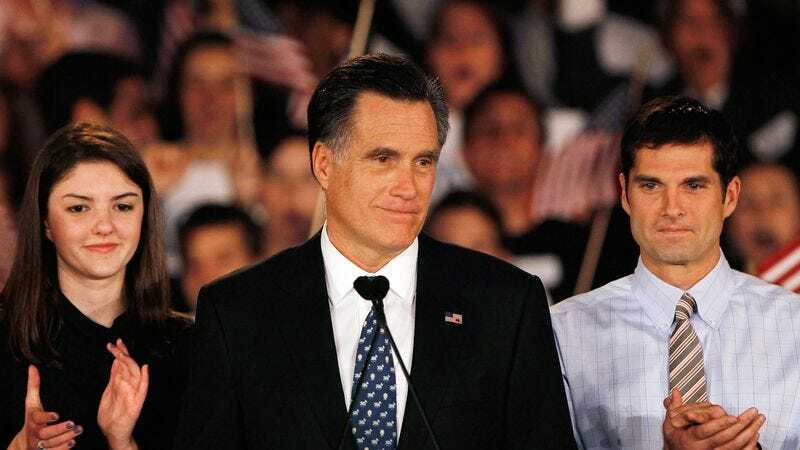 BOSTON—While delivering his concession speech at the Boston Convention and Exhibition Center Tuesday night, Republican presidential nominee Mitt Romney uttered the 240,000th and final lie of his 2012 campaign when he offered his “sincere congratulations” to President Barack Obama. “This has been a hard-fought and closely contested campaign, and while we’ve had our share of disagreements, there has always been a great deal of respect and admiration between myself and the president,” said Romney, concluding 17 months’ worth of manipulative falsehoods, half-truths, and outright fabrications with one last bald-faced lie. “Tonight, the American people made their voices heard. And now I urge every one of my supporters to set aside their differences with my opponent and join me in standing behind our president, so that we all may come together in a spirit of understanding and cooperation to build a better America.” Romney then concluded his speech by expressing his thanks for the tireless efforts of his campaign team, marking the 12th and final true statement of his nearly six-year-long White House run.